What is the FlipPlan Downloadable Planner? FlipPlan is a free paper-based printable planner and calendar designed to put all of your useful dates in your pocket.FlipPlan allows you to print out a calendar for the next 7-8 weeks dependant on your settings. Why develop the FlipPlan Downloadable Planner? I’m currently working in an environment where it’s awkward for me to carry my phone around. All of my calendar appointments are held in Google Calendar so if someone asks me if I’m available at a certain time or day to do something I can’t give an answer straight away, I have to wait until later then go and check my phone. Add into the mix that I have a terrible memory so I struggle to remember the dates and times, plus the poor phone reception (in this day and age? I know, right!) and it’s a recipe for me missing an important date.I looked around on the internet and remembered that there was PocketMod which I tried out years ago and I thought that would be a perfect solution. Unfortunately it was lacking in a couple of areas: firstly when I added months to my mod it only printed out 28 days and secondly you had to manually write in all of the dates which – while not a major issue – was something I thought could have been done by the app. That’s why I came up with the FlipPlan. Who is the FlipPlan Downloadable Planner for? Anyone who needs a portable, flexible lightweight calendar that fits easily in their pocket. It’s free and simple to use and only uses one sheet of A4 or Letter paper! Simply fill out the form below and click on the “Generate” button. A new window will open. You can then print out the planer, cut it out, fold and you’re ready to go – it’s as simple as that! To add your Google Calendar Events automatically to your FlipPlan, select “Use Google Calendar from the drop down and click on the “Connect me to my calendars link”. You’ll then be taken to the Google website where you can select your account and give FlipPlan access to read your calendars and event list. Once you’ve done this, you’ll automatically be brought back to the FlipPlan page where you can choose the calendars you want events to be displayed from. Events will be coloured based on the colour you have specified in Google. Don’t worry, FlipPlan doesn’t keep any of your Google details, your connection to Google only lasts 1 hour and we can’t see any of your other data other than your calendar events, nothing is stored and it’s all securely handled by Google. Why Use The FlipPlan Instead Of Google Calendar? As well as being able to print a handy foldable monthly calendar, the FlipPlan has one big advantage over Google Calendar’s monthly calendar printing – all events have end times printed too!It may sound like a simple thing, but when I print out my monthly schedule from Google calendar and hang it on the fridge no-one knows what time to expect me home – it’s a small thing but such a big annoyance! I work different shifts so for people to know when I’m due back (which is important not only for meal planning but safety reasons as well) they have no clue with the Google Calendar when my shift ends unless I go through my calendars and then manually write every event end time on it with a pen – how useless is that?! 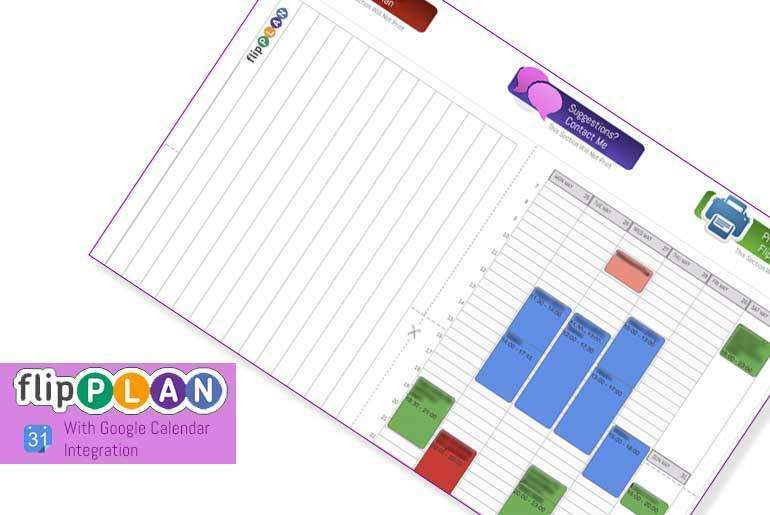 With the FlipPlan, Select “Full Page Month Calendar” as the Plan type, select the month & year you want to print , connect FlipPlan to your Google Account, select the calendars you want to use and generate your plan and you can then print it with start and end times of events – neat, huh?! What other things are planned for the FlipPlan? Page Selection – Choose what page goes where. Connect Me to my Google Calendars! The colour of the event time. Note: If the selected day matches the start day then your previous/next week start selection will be ignored. If no date is selected then today's date is assumed.